Dr. Gregg Levine, a volunteer veterinarian for the Hawaiian Islands Stranding Response Group, injected an antibiotic yesterday into one of two melon-headed whales being held in a tank at the Marine Base Hawaii at Kaneohe. 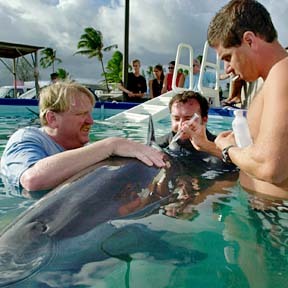 Holding the whale were Dr. Robert Braun, left, president of the response group, and Brad Ryon, center, protected-resources management liaison for the National Oceanic and Atmospheric Administration. The whales were discovered Tuesday off Hauula Beach Park.